Trends Audio presents the PA-10.1D Tube Headphone/Pre Amplifier for bi-amp audio systems. This device has a MSRP of $299. 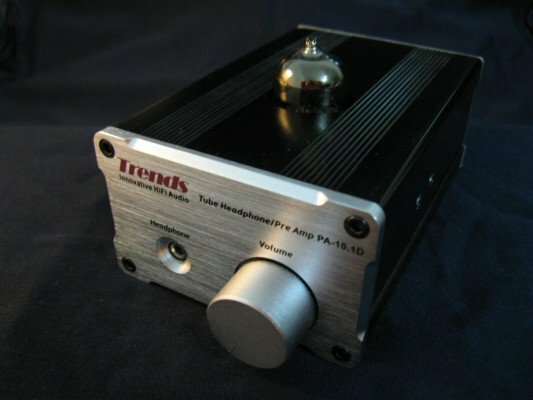 ITOK Media Limited's innovative Hi-Fi brand "Trends Audio" (www.TrendsAudio.com)launched its new innovative Hi-Fi product - Trends PA-10.1D Tube Headphone/Pre Amplifier. It provides all functions of headphone amplifier and pre amplifier as well have fun tube rolling. New Trends PA-10.1D includes a swithchable input(CD/DAC or PC/iPod)and two inputs for targeting Bi-amp audio system below US$1,000 budget. Meanwhile, it applies ELNA capacitors which result in improved transient performance, enhanced spatial accuracy and low frequency realism. "With pure class-A circuit and low voltage hybrid (tube/transistor) preamp provides audiophile quality sound and easy/safe DIYer accessibility, new PA-10.1D Tube Headphone/Pre Amplifier is an affordable and compact hybrid pre amplifier and the economical way to enter the true high fidelity headphone system." say David Ho, the marketing director of Trends Audio. "As you know, the Hi-Fi product is no longer <>. In addition, changing different tubes to taste for different sound is the great fun for many audiophiles and also a great feature of Trends PA-10.1D. A creative device that you can use to add color to individual tracks. As the sonic differences of individual pre amplifier become more apparent to your ears, you can begin to see them as colors in your sound palette, using them on different tracks and in different settings to build a distinctive sound." Support both 6DJ8/6922 series and 12AU7 series tubes by simply switching the jumpers. The innovative circuit design of low voltage hybrid (tube/transistor) pre-amp to provide audiophile quality sound. Besides the normal audio output in the back panel, ONE headphone output in the front to drive even high-impedance audiophile-grade headphones. compact design (mini-size & light weight), suitable for hi-fi room, living room, sleeping room or even right beside your laptop computer or iPhone-Fi. TWO precise screw-driving potentiometers for professional audiophiles to adjust the tube*s bias voltage to guarantee the best working point for different tubes. require just a single +24V power supply ONLY, besides the bundled AC adaptor, audiophiles can apply all other power supply with the same spec., e.g. lead-acid batteries. Separate pre-amp unit & power adaptor to minimize interference and flexible to apply other power sources, e.g. lead-acid battery. New stylish aluminium case(4mm thick) provides outstanding shielding & grounding capability to keeps the background silent and maximize the S/N ratio.